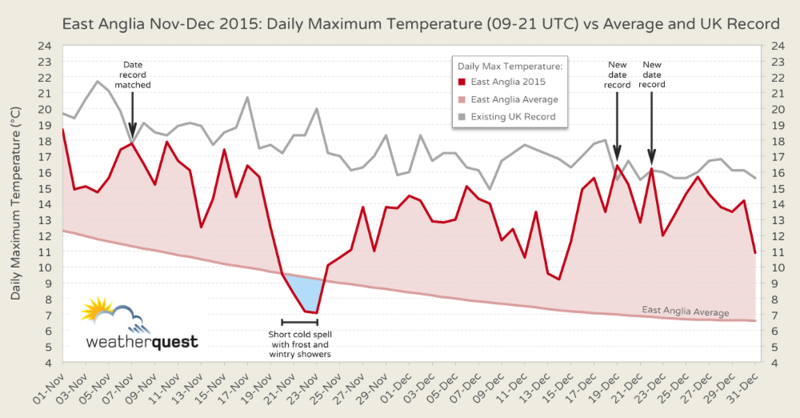 December 2015 will, for many, be remembered by just how exceptionally, and consistently, mild it was - in fact, as the graph below highlights, every single day throughout the month saw daytime maxima above average at least somewhere in East Anglia. The same is also true for November, with the exception of one weekend around 21st-23rd where a brief northerly plunge of cold air saw some sharp frost and few wintry showers in parts of the region. The mean temperature for East Anglia was 10.0C for December, which is 5.5C above average, making it not only the warmest December on record and smashing the previous record of 7.8C set way back in 1934, but also warmer than any November since records began. A far cry then from just 5 years ago when December 2010 set records for the coldest ever, with a mean temperature of just 0.0C - 4.5C below the average. 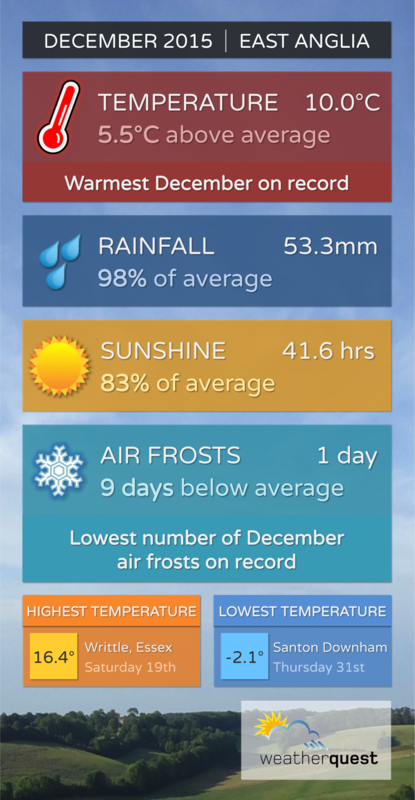 The persistent, humid southwesterly flow in December 2015 meant that it was often cloudy, with 83% of the average amount of sunshine hours, but rainfall was close to normal at 98% of the average. Given how exceptionally mild the month was, the distinct lack of air frosts (0.2 days, compared with the average of 10.1 days) meant that the month produced the lowest number of December air frosts on record. In fact, the only time when air temperatures fell below freezing across East Anglia was actually during the early hours of 1st January (but still technically considered 31st December as each day's extremes/totals are measured between 09:00 - 09:00 UTC).